After two crushing defeats to the Philadelphia Flyers in a home-and-home this past weekend, many Penguins fans were left wondering why. Many fans suggested this was the same old Marc-Andre Fleury we have seen the past few postseasons. Many fans also pointed to the lack of production from stars like Sidney Crosby or Evgeni Malkin. Yes, it was indeed a fanbase implosion at its finest. Well, cheer up Pens fans, I am here to explain 5 reasons why the Penguins will win the Stanley Cup. A way to help negate problems with team injuries is to have a strong power play unit and a strong penalty kill unit. Teams that win the special teams battle usually win the game, or in this case, the series. Even after the Penguins had a few blunders over the weekend, they enter the contest on Tuesday against Dallas with the number one ranked power play unit and the number three ranked penalty kill. It is often said that a team is doing well if they are at or above 100% when adding both special teams numbers together. The Penguins are currently at 110.4% (24.3 PP, and 86.1 PK). They have a real chance to finish the season first in both categories, which would place them as the first team to do so since the 1984-85 Islanders team. That team lost in the division final, but did happen to win four straight Stanley Cups with many of those same players in the years leading up to that season. If the Penguins can keep up these percentages in the postseason, they will make it difficult for any team to beat them coming out of the East, including the Bruins. 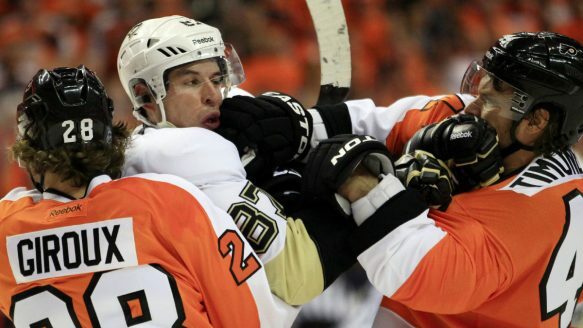 It is pretty clear the Penguins would like to avoid the Bruins and Flyers at all costs. The Capitals are sitting just outside of the playoff picture currently, but would be a welcome addition for the Penguins. They went 4-0 against the Capitals so far this season. 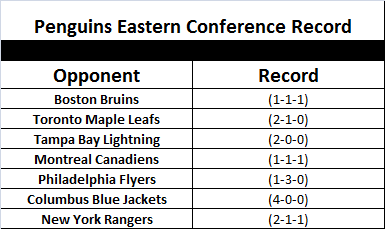 If the Penguins get a little help with matchups initially, they will be evenly matched with the Bruins and have as good a chance as anyone to knock off a team from the West. It sounds simple, and it pretty much is, but the Penguins are lucky enough to have the services of Olli Maatta. He is currently seventh in the team in points and ninth in goals. 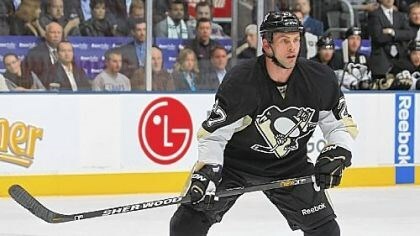 He is a +8 and has thrived in any position or situation the Penguins have put him in. With him being only 19, we are seeing Olli's maturation process happen over the course of the season. He has always been defensively sound and in the proper position, but his offensive skills have really come alive as of late. If it wasn't for Nathan MacKinnon running away with the Calder, Maatta would get some serious consideration. He has been talked about in the same breath as Nicklas Lidstrom, and that is not something that is easy to do. It is never guaranteed how such a young player will perform in a high pressure situation like the playoffs, but if the Olympics were any indication, Maatta will continue to thrive. After the trade deadline, the NHL Network said the Penguins were not favorites in the East because they don't have a defenseman that jumps out at you. Well, the Penguins do, and his name is Olli Maatta. While many Penguins fans may view this as a shaky point, the fact the Penguins have Marc-Andre Fleury is a positive. In fact, he should be the frontrunner for team MVP. He is leading the league in wins and has a very respectable GAA of 2.29 and a save percentage of .918. Those numbers are not all-worldly. In fact the GAA and save percentage are 12th and 13th in the league, respectively. The biggest reason fans should be excited about Fleury is what means the most sometimes... the eye test. Fleury has just looked more confident all season. He has looked like the Fleury of 2008 or 2009. When the team has need a big save, he has been there. Some games that could have gotten more out of hand due to some defensive breakdowns were held in check thanks to Fleury. I believe the offseason counseling he received will reap major dividends come this postseason. 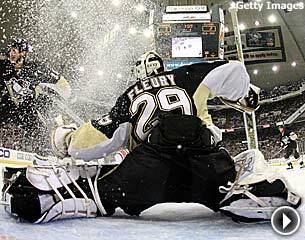 The Penguins needed to ride Fleury in more than a couple of games during their Stanley Cup run in 2009, and they will need to do the same this postseason. I think Fleury has proven over the course of the year that this team can depend on him. As dreadful as the Penguins lineup looked this weekend against the Flyers, help is on the way. 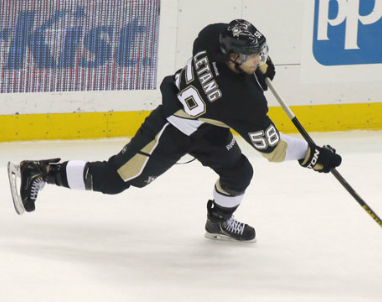 As of Sunday night, Kris Letang and Beau Bennett were cleared for full practice. This is huge news on multiple levels. Beau Bennett could provide immediate help to the third line, and possibly even to the top-six depending on how he performs down the stretch. As far as Letang, many experts thought he would at least be done for the season, if not for his career. If you believe the theory that this condition may have affected his performance earlier this season as well, he could be back to 100% by the postseason and really provide a pop to the blue line. Don't forget that Paul Martin should be back by the first-round of the playoffs, and Tomas Vokoun could make his debut sometime in April. It never matters which team is hot during the year. It does matter which team is hot at the right time, and it could certainly be the Penguins year if all their pieces come together by May. Were there a lot of ifs or maybes in the above article? Sure, but these scenarios are more likely to take place than the impending doom that some fans think is on the horizon for this team. Did the Penguins lose two games to their archrival this weekend? Yes, they did. Are they perfect? No, and quite frankly, this is the weakest Penguins team in the past five years. That being said, this team still has Crosby, Malkin, Neal, Kunitz, and Fleury. Not to mention plenty of help on the way in terms of injuries. This team may not be the strongest Penguins team of the past five years, but it is a team that could certainly win the Stanley Cup in June with a little luck and a bit of a hot streak.